Having trouble with your new baby schedule. This mum has you covered. Frustrated mum invents awesome app, wins parenthood. This one is for all the sleep-deprived mums. Caring for a newborn is incredibly overwhelming. We get it. Newcastle-based Tara O’Connell really gets it. She found herself single without warning, with no money to support her three-month-old baby. She was devastated, confused, and alone. Going back to work full-time wasn’t an option for her. Instead, this clever mum decided to create an app that would make her life and the lives all all mums much, much easier. It’s called The Baby Diaries, and the app allows mums to track their baby’s schedule and keep on top of everything that needs to be done. It tracks your baby’s feeding, sleep and nappy routine as well as keeps a record of all their milestones, so years later when someone asks you how old your baby was when they crawled, walked, talked and smiled, you’ll be able to look it all up. Newcastle-based Tara said she came up with the idea during a moment of crisis. When Alexander was barely 3 months old I became a single mum with 100% care of him, literally without warning. It&apos;s fair to say my world was falling apart. Then four weeks later Alex became quite ill. As I was standing in the Emergency Ward the nurses were asking how many wet nappies Alex had had in the past twenty-four hours. I had no idea! I turned to my sister, who is a midwife, and said "surely there&apos;s an App for this?". After much research I did find some Apps that did some of the things I wanted, but I couldn&apos;t find anything that did everything I needed all in one app. So I decided to turn a bad situation into something positive. Tara has an older son, Jacob, born in 2001 and she remembers all too well how she had to keep notes by hand with paper and pen. She also remembers suffering from post-natal depression with Jacob, and was determined to make her life as a new mum much easier the second time around. It brought it all back (Alexander&apos;s birth). With around 15% of all new mums diagnosed with postnatal depression, and 85% experiencing “baby blues” I saw developing a tool for mums, using technology now available, as a real opportunity to make a difference. The enterprising mum recently won Bronze for The Baby Diaries in the Emerging Ausmumpreneur category at the national St. George Bank Ausmumpreneur Awards. The app has now been downloaded on every continent on earth, and in fifteen different languages. She says she&apos;s shocked it&apos;s become so popular, so quickly. I thought it would take a few years to gain real traction. Only 1% of all apps are successful. This is either a daunting figure or a great challenge depending on how you look at it. I absolutely love the marketing and PR role I play in ensuring mums across the world know about The Baby Diaries. The app has now been downloaded on every Continent on earth, and in 15 different languages. I can&apos;t express how truly happy that makes me feel! So many mums are benefiting across the globe. Tara reminds us that it&apos;s incredibly important to keep track of our baby&apos;s schedule and routine for numerous reasons. On a daily level, it&apos;s essential to keep records of things such as wet nappies, as this is a good indicator that baby is feeding sufficiently. It&apos;s also important to keep track of milestones, again to ensure that, should they become unwell you have a good record of information to show your medical professional. Ms O’Connell has now released an updated version that has a push function to allow data to be shared between carers. I developed this with nannies and babysitters in mind, but certainly it is also a great tool for parents who are separated and sharing care of a baby or toddler. She feels strongly that the app can help new mums to cope better, by helping them stay on top of everything. 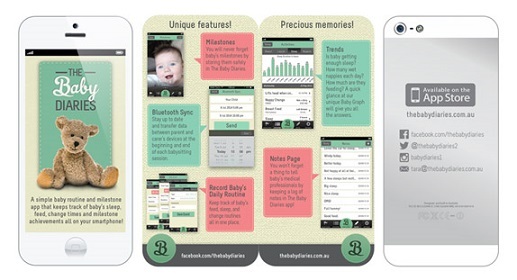 Would you have found an app like this useful when you became a new mum? This is how much sleep you lose in your first year as a parent. 11 things we&apos;ve learned in 8 years of pregnancy.